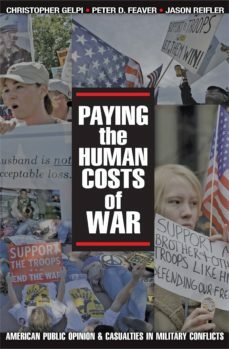 From the Korean War to the current conflict in Iraq, Paying the Human Costs of War examines the ways in which the American public decides whether to support the use of military force. Contrary to the conventional view, the authors demonstrate that the public does not respond reflexively and solely to the number of casualties in a conflict. Instead, the book argues that the public makes reasoned and reasonable cost-benefit calculations for their continued support of a war based on the justifications for it and the likelihood it will succeed, along with the costs that have been suffered in casualties. Of these factors, the book finds that the most important consideration for the public is the expectation of success. If the public believes that a mission will succeed, the public will support it even if the costs are high. When the public does not expect the mission to succeed, even small costs will cause the withdrawal of support. Providing a wealth of new evidence about American attitudes toward military conflict, Paying the Human Costs of War offers insights into a controversial, timely, and ongoing national discussion.